Daily Illuminator: Expand Your Munchkin Collectible Card Game Knowledge! December 30, 2017: Expand Your Munchkin Collectible Card Game Knowledge! As the release of the Munchkin Collectible Card Game grows nearer (February 2018, so preorder at your local game store! ), our team has been busy cranking out articles on our official site, covering everything from deck-building to Hero strategies, and even organized play. If you haven't been keeping up, here are a few articles to get you up to speed, so you're ready to take on any opponent when the game releases! Building a Constructed Deck: What are the next steps after you've played with a Munchkin CCG Starter Set? Check out this article to find tips and tricks about building your own constructed deck, using the Elf Thief as an example! Munchkin Collectible Card Game - Planned Tournament Schedule: Take your game to the next level at your local game store and at conventions! Our 2018 tournament and release calendar features the major dates for release events and the upcoming sets! Stomp Your Foes (And Their Stuff, Too) As The Centaur Warrior! : Continuing our series of articles highlighting each hero, the Centaur Warrior takes center stage! Get the intel on her strengths and weaknesses to see if she's the hero for you! Keep checking our site for more articles; we post them regularly. 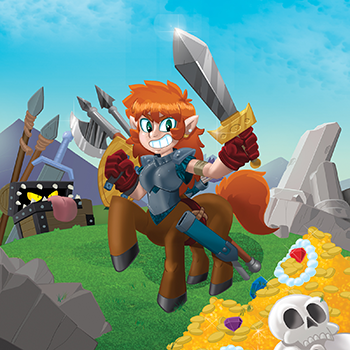 You can also like our Munchkin CCG Facebook page, where we share sneak peeks at cards, and even run contests!